Public tours run every Wednesday, Friday, and Sunday from April to October, with at least three people required. Private tours are available every day all year round. For private tours, we pick you up at your accommodation. 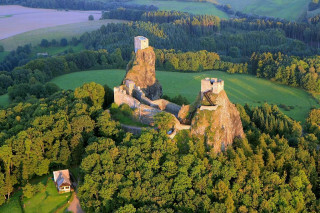 We will go to Cesky Raj in our van. It is about an 80 minute-drive (100km) from our shop. where we come back late in the afternoon. The meeting point for group tours is our office at Vratislavova street 58/3, Vysehrad-Praha 2. The tour starts at 8:00 am. 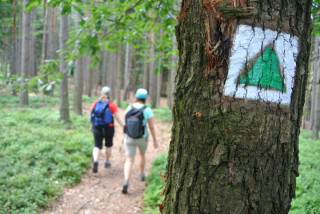 While this tour isn't too difficult, you should have a decent physical fitness. Vratislavova street 58/3, Vysehrad-Praha 2. 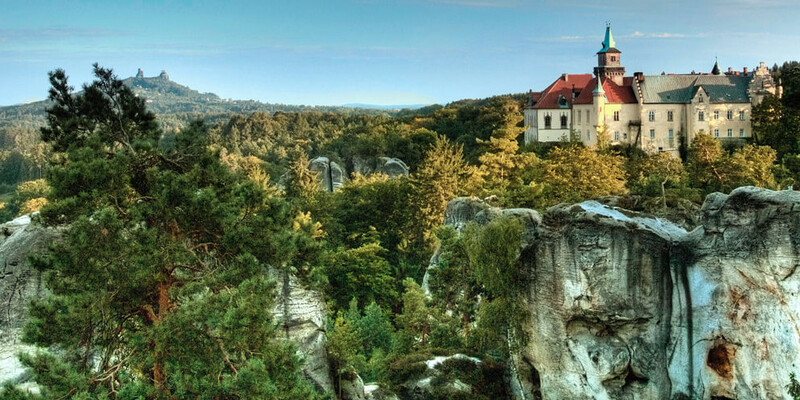 Cesky Raj means “Czech Paradise,” and it gets its name for a reason. 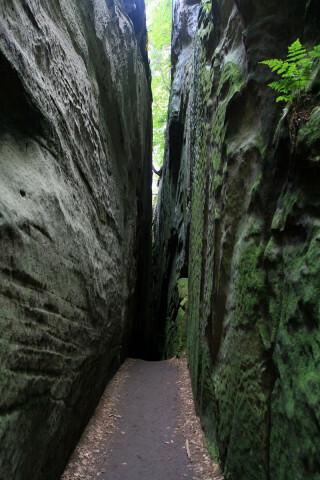 Explore the day away at the UNESCO World Heritage site of “the rock city," and find a little slice of outdoors heaven. We kick off the day’s journey at 8:00 am. We either meet at our office in central Prague for an 80-minute drive, or for private tours we pick you up at your place. 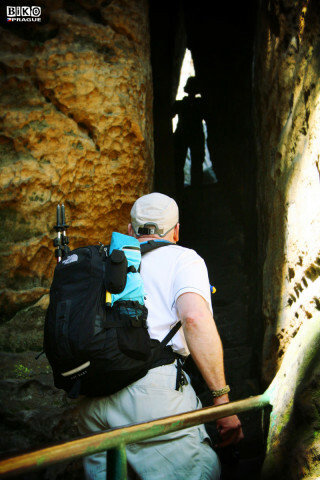 You don’t need any particular skill for the trip, just be slightly fit, as there are several ups and downs. 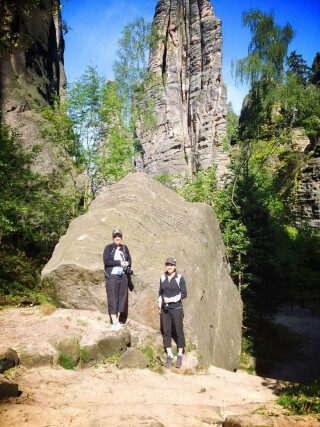 On this 8-15 km hike, we explore the characteristic sandstone rock pillars. 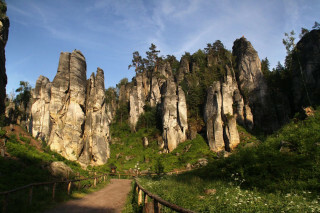 Many of them have been shaped into unique and curious shapes by wind, water, frost, erosion, and people. Wander your way around, under, and over 300 towering pillars. 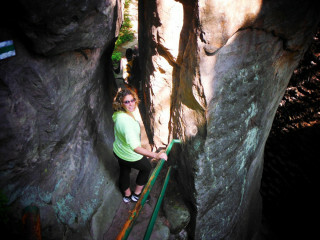 We discover rock gates, niches, caves, cavities, balancing boulders, and rock mushrooms. The surrounding forests could be straight out of “Lord of the Rings,” adding to the mystical atmosphere. 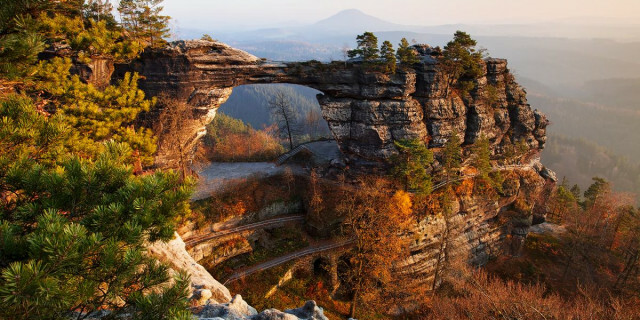 Several looks along the way provide striking views of the unique landscape. Halfway through our hike we rest and re-energize with traditional Czech food in a typical restaurant at one of the info centers (from May to October). Depending on the season we finish our 4-5 hour tour by visiting one of 3 nearby destinations. The beautiful historical town of Jicin, the mysterious hill-castle of Trosky, or Oborsky lake, a great swimming destination in the summer. 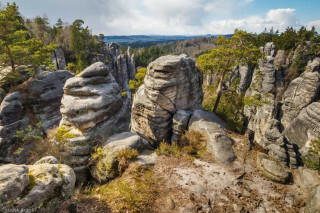 Enjoy the natural sandstone wonders of the Czech Republic and see why this otherworldly site is under UNESCO protection. You'll even find a piece of paradise yourself.